Ever have a conversation with someone and have to use every ounce of energy not to speak your mind? I was having a candid money chat with a (have all the answers) friend of mine about having some savings on hand in case of the worst happening. He looked at me with a puzzled face and replied “why would I need savings when I have money in my RRSPs (401k for US residents) for scenarios like that?” Rather than going off on a tangent on deaf ears, I’ll vent to my keyboard instead. Sorry that you’re going to take the brunt of it. Super High Taxes. RRSP withdrawals are taxed at your full marginal rate for that year. Hypothetically speaking, say that $5,000 is needed for an emergency, and you’re in the 40% tax bracket. Providing that you don’t jump to a higher bracket because of the new income, you’ll only receive $3,000 after taxes. Granted that only 10% is taken immediately upon withdrawal (for <=$5,000), but the rest will be tax owing at the end of the tax year. The exception where taxes would matter less is if it was a low income year. Contribution room is lost forever. RRSP’s allow for 18% of your previous years income as contribution room which can be carried forward if not used. Once money is withdrawn the contribution room, and potential tax free growth from it, is lost forever. Risk of Selling Low. If the markets are in the down turn at the time and you need to withdraw from your RRSP, guess what, you materialized your paper losses. The Extra costs. If you own stock, you’ll have to pay commissions to liquidate. If you own mutual funds with deferred sales charges, you’ll have a hefty premium to pay to sell early in the term. Why not save a few dollars in a high interest rate savings account or even have a HELOC/LOC ready to go for an emergency fund? Even in the financial planning class, they are telling us that lines of credit are good enough for emergency funds. No need to waste your money and park it somewhere at a small and fully taxable 3%! To us, an emergency means either my husband or I have just lost our jobs and in fact, one of us losing a job would still not constitute an emergency for us. If that is the case, then #1 does not apply. #2 is a good point, but due to restrictions on RRSP contributions due to having worked in the US (and no PA adjustment), my husband and I have ample contribution room ($70-80k each) which we have carried forward for a number of years. As for #3, if you’re going to keep an FI component in your portfolio, it makes the most sense to keep it in a registered account so selling low wouldn’t be an issue here. #4 doesn’t apply to us either as most of our RRSP’s are in TD efunds. I suppose our situation is somewhat unique, given our tax situation, but it works for us because emergency means a REAL emergency when you realize you have to withdraw from your RRSP to get to it. In a real emergency, we’d cut back on the 20% RRSP contributions and make other adjustments or use the unused LOC before ever withdrawing from the RRSP. If we were to keep a taxable emergency fund we’d likely have to downsize the current RRSP contributions to fund it and that would mean less forced savings for us (and early compunding) so this method has worked quite well so far. Telly, LOL, I should have been more specific to his situation. He’s a fairly highly paid engineer, and what he considers an emergency is if he needs a new roof. I don’t think he’s thought through the prospect of losing his job. Most folk have not consumed their RSP contribution allowance any way, so the issue of lack of contribution room is a moot point. If you have a full RSP, then the removal of a few thousand dollars will not change it that much, over it’s life span. Worst case, you have to work a bit harder or longer once the emergency is addressed to replenish your RSP. If the tax return from the RSP investment is re-invested you have ‘overcontributed’ to your RSP compared to your savings account. A REAL emergency would mean a reduction in income, likely due to job loss; for most of us, covered by Employment Insurance. As Telly commented, having the Emergency Fund in an RSP forces you into a considered decision to make a withdrawal. 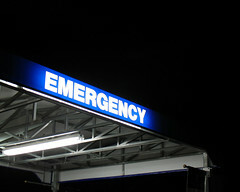 In the USA, where an emergency could be due to a medical issue, large Emergency Funds might be more important. So I would have no problem maintaining the usual suggestion of 4 – 6 months expenses as part of my RSP. Since it’s only for an unexpected emergency, I don’t expect to use it. DAvid, your point about medical issues in the US being potentially damaging is a good one. However, most 401k plans allow you to borrow against them but do incur an interest charge, payable back to your account. Of course, the loss of growth is the biggest problem with that. My 401k allows for a loan of up to 1/2 of its value, with an interest rate (currently) of 6.25% repayed through my paycheques. The loss of my job however, would be an issue! Actually, as you later mention, if you’ve been “overcontributing” to the RRSP instead of your savings account, the miracle of compounding means you’ll likely be able to retire earlier, even if you do make an emergency withdrawal from your RRSP at some point (though again, you likely wouldn’t). Have you ever seen those commercials for V8(a vegetable drink)? Well they usually have someone ordering some sort of unhealthy food like a cheeseburger with no lettuce or tomato. Then the person takes the order just smacks them upside their head. Thats what I would do: smack them on the head and walk away. Someone that dumb probably wouldn’t learn from reason, you need to associate bad things with talking about taking money out of their 401k. Kind of like Pavlov’s dogs. An excellent post, but I must take issue with #3 – Risk of Selling Low. Many moons ago, I would constantly argue on usenet about realized vs. unrealized losses. A loss on paper is a very real loss because it is what proceeds you would receive today if you were to sell. In my opinion, to believe otherwise would just be denial. Far too many “investors” (and I use the term facetiously) hold on to dogs based on nothing more than the erroneous assumption that they will once again rise to their former glory. This way they can justify holding onto losing positions. One of the best things investors and traders can do is to learn how to take small losses in the stock market. I tend to think of the rrsp as a bit of a safety net as well. If I’m unemployed long-term for example. One thing to keep in mind is that although you pay marginal rates on withdrawal, you might not be losing any money. For example if you contribute $1,000 per month and then withdraw $8000 in August – then the tax you pay/owe on the withdrawal is the same amount you would have paid if you had never made the contribution in the first place. In that case, you are really only losing the contribution room which I value quite highly. You’ve got to be careful about the dumping the dogs theory, as it can lead to buy high – sell low behaviour, chasing after ‘hot’ stocks or sectors. One of the strengths of the non-leveraged long position is you’re not forced to sell due to a dip (unless you’re using stocks/bonds/etc as an emergency fund). Personally, I try to buy companies that appear to have something going for them. Unless that something changes, I will normally hold the company even if the price stock falls. The question is would you buy the stock at the reduced price if you didn’t already hold it. If you’re dealing with ETFs as your emergency fund, the risk of selling low is magnified as you could be forced to take losses for no better reason than the market is having a bad month. It’s definitely true though, that some people will sit on their $200 book value / share Nortel stocks hoping to just break even. Never going to happen. As to the original topic, I prefer to have a ‘double deep’ savings account. The first layer is for real emergencies (car repair, roof blowing off). The second is for unplanned stuff, such as a buying opportunity in the stock market or that occasional need to splurge. I much prefer to save cash for both as I dislike being forced to sell investments at a time not of my chosing, or use debt which can become very expensive. I have an LOC on tap with a reasonable interest rate should I need it for emergency funds. I prefer this method to having idle cash earning very little interest as a source of emergency funds, as the emergencies that would actually require a withdrawl of additional funds are few and (hopefully) unlikely to occur and the interest I’d pay on short term borrowed funds is easily offset by the interest I am earning on investing my cash rather than saving a portion for emergencies. Having two solid incomes in the home helps a ton, since if one of us loses our job, we’d still be able to make ends meet. I’ve heard of eschewing an emergency fund in favour of a line of credit, and if I weren’t so risk-averse, maybe I could justify that. But dipping into an RRSP for short-term pitfalls? That’s just silly. From where I sit, there are only three legit reasons to take funds out of an RRSP: You’re buying a house, you’re continuing your education (both of which can be done relatively penalty-free under Rev Canada’s HBP and Life-Long learning programs) or, funnily enough, you’re retiring. Any money you think you might need in the next few years ‘in case something bad happens’ probably shouldn’t be going in the RRSP in the first place.